Welcome to our New Orleans swamp tours and Wetlands adventure! 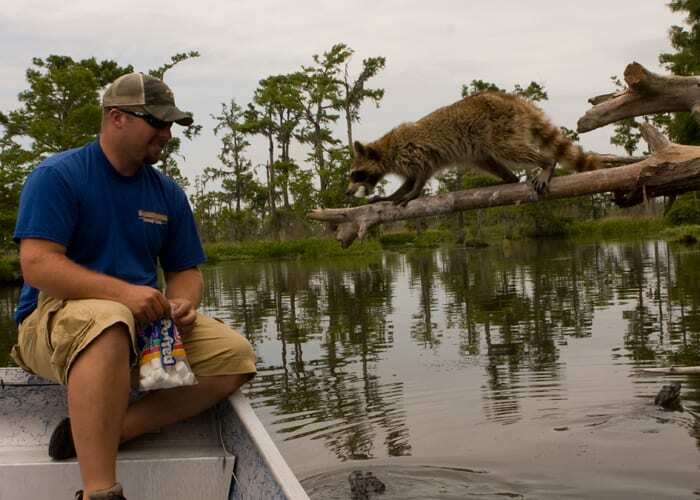 See the Cajuns of the bayou living and surviving in harmony with the swamps. Here, the waterways are their highways. From the relaxed comfort of our covered New Orleans swamp tour boats, we will drift slowly past a 2000 year old Indian Burial Mound, a Cajun cemetery and fishing village! You may see the wildlife that made the Barataria Swamps the Crown Jewel of the Louisiana Purchase. Here, birds, snakes, turtles, fur animals, and gators are the king of the swamp and easily spotted in spring, summer, and fall. Alligators do hibernate during the cold winter months, but lay on the bayou banks on warmer days. So even in winter, our native captains can sometimes find a sunning gator on our tour. The slow drift of our tour boats through moss draped trees and small waterways, will provide ample opportunity for viewing and photography. 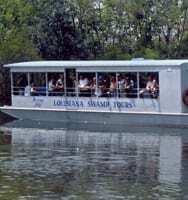 The New Orleans swamp tour boats are fully narrated and our captains are natives of the Barataria Swamps with a background of gator hunting, fishing and trapping. They will entertain you and amaze you with the ecology of the swampland. They have lived the life! Board our swamp tour boats that are specially designed for your comfort. They have a roof, restroom, cushioned seats, and windows that can be raised or lowered during cold or rainy weather, along with plenty of standing and walking room. These New Orleans tours are entertaining, educational and exciting. It provides you with a relaxing view of our beautiful Louisiana swamps. Since Hurricane Katrina, our company does not process any credit card charges on your Internet reservations until 48 hours of the scheduled tour. You have the right to change or cancel withing 48 hours of your tour date and time. To cancel or change your reservation, you must call our office within 48 hours of your tour. Failure to claim you reservation, will result in the loss of your payment. A “change of a tour time” will only be allowed: “based upon tour availability”. We will process all reservations as soon as they are received. In the event that a requested tour and/or time is not available, then we will contact you by email or cell phone and advise you to any possible alternate tour times that would be available. In the event of extreme cold, strong winds, rainy weather, the company reserves the right to cancel a tour based upon safety related issues. If we cancel a tour, the client will be allowed to move their tour to another day or time. If the client cannot move their tour, then a full refund will be issued to the credit card on file. It will take three days for a credit to be registered on a bank statement.